Carrying a potted tree by its trunk is like carrying a baby by its neck. You will not kill it, but you will stress it so do not do it. When collecting your trees personally from the nursery, always make sure that a covered vehicle is used (or shade netting is available to cover them completely) trees will suffer from windburn if exposed. The fast growing tips are soft plant tissue and must be cared for. The combination of wind force and high air temperatures can cause extreme stress to the young trees if transported in open top vehicles. 1. Unpack them as soon as possible. They were watered before leaving the nursery, but will appreciate a good soaking on arrival at their new home. When unpacking them, please be sure not to hold the tree by its trunk, but hold it by its pot. Place your trees on a well drained site – concrete, gravel, pallets, or a grassed area where water will not pool. To keep them from falling over, in the short term you can tie some baling twine loosely around them, or if you are keeping trees for a longer period of time before planting, place hay bale biscuit around the outside pots. If kept in full sun – water lightly every day until planted. If kept in part shade or in winter time, watering may only be needed every 2 to 3 days. To check on how adequate your watering is, after watering pick up a few plants at random. If the mix is dry and crumbly, the trees will require more water. If the bottom of the bag is shiny or glassy, the trees need a little less water. There is no need to place the trees in a shade house on arrival. We regularly have winter temperatures down to minus 3 degrees Celsius at Olives South Africa and sometimes down to minus 5 degrees Celsius. If you regularly receive frosts below minus 5 degrees Celsius, and are planning to take delivery of your trees during winter and hold them in pots until warmer weather, then you may want to place the trees under the partial cover of a large shade tree or on the western side of a shed, to protect them from frost damage. Other ways to prevent frost damage is to have your irrigation set up and available to the trees whenever needed in order to keep them stress free. 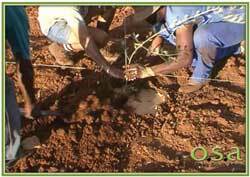 Once your trees are in the ground, watering is reduced to approximately once per week. In extremely hot periods, a light top up of water to the top few centimetres of soil in the middle of the week may be necessary. 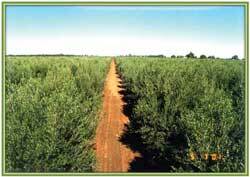 Research throughout the world recognizes that 250 – 300 trees/ha is an economical spacing for irrigated olives. 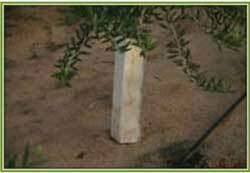 This spacing allows the mature olive tree to develop a canopy five meters in diameter. Regarding space around the outside of your grove, an eight meter wide ‘buffer zone’ alongside any immovable object or non-accessible area, such as a fence, building or water course, should be adequate for most machinery to operate. Have you allowed for Roads? In general, I would recommend that road access is allowed across the rows every 250 to 300 meters. 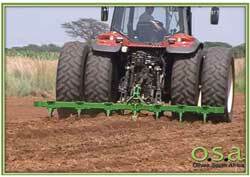 The reason for the rows being this length is to allow machinery to move freely through the grove. An incredible amount of time would be lost if the rows were half a kilometer long and machinery could only access the orchard from either end or the rows. Consider the economics of delivering empty bins and removing full ones in long rows. An occasional side-access road in the grove can be a very economical decision. It will normally require the loss of one or two trees in each row but that loss may be outweighed by the time savings further down the track. You can imagine how disappointing it would be to see fruit on the trees ready for harvesting and not being able to mechanically harvest because the wet roads could not carry the machinery required. Topography of the site may be relevant in terms of drainage and irrigation and the map could include contours at a suitable ‘contour interval’. The actual area available for the grove can be determined in advance, hence the number of trees at the desired spacing can be calculated and the appropriate order placed. Organic growers use no synthetic fertilizers or pesticides. They replace these energy-expensive, ecologically damaging inputs with natural ground-rock fertilizers, composted manures and plant residues, seaweed extracts, biological controls and natural and botanical pesticides. Because organic growers do not have access to the synthetic pesticides, creating a healthy growing environment, with effective natural biological controls, is essential.